"He has always been very active and his laughter and happiness gave me the strength to live my life. Despite my poverty, I have always managed to give him healthy food. I was very cautious about his upbringing because I already feel guilty about the troubles that my daughter, who is a special child, is going through. I thought my son is growing healthy and I was thankful for it but now I feel betrayed. His rare disorder does not allow him to be like any other children. He is always tired, he sleeps for the whole day. He is attacked by infections one after the other, his body is full of rashes and black spots." 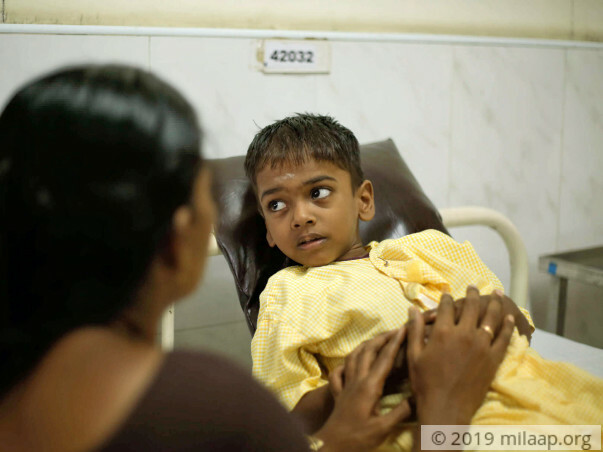 - Nalini, Mother of 7-year-old Motheeswaran. 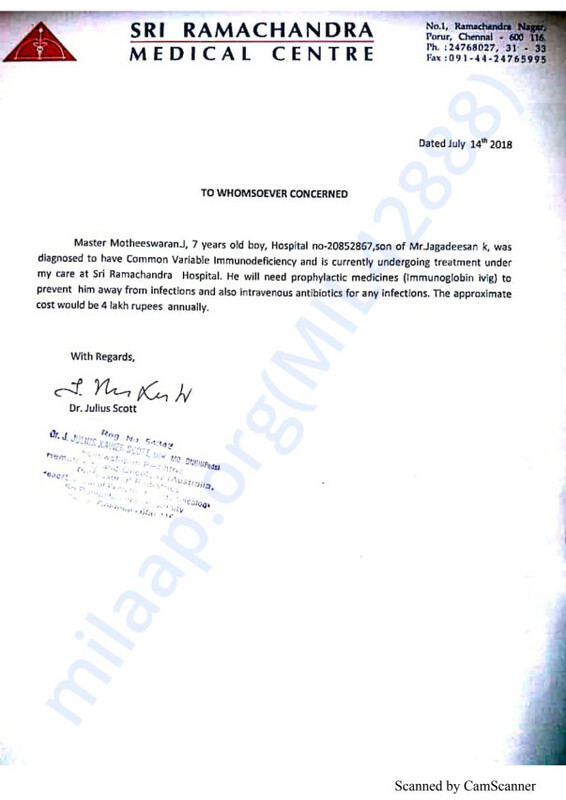 Motheeswaran was healthy until 3 years ago. Suddenly he fell sick and had a severe cold that refused to go for months. He became very tired and he hardly got up from his bed. After several tests, he was diagnosed with a Common Variable Immune Deficiency, a disorder that repairs the immune system completely. People with this disorder are easily susceptible to recurrent infections, particularly in the lungs and ears. "It is painful to see my son going through so much of trauma. He doesn't realize that he had slept the whole day. He wakes up and cries a lot. One day, his teacher sent him back home saying that he is not able to focus and too tired to even sit. He takes a lot of medicines for the infections. Cold has almost become a part of his life, it is not going away, he struggles to even eat sometimes. I don't know what to do." Nalini's husband left her all alone to struggle for the rest of her life. It has been a year since he left them and he didn't turn up even once to see them. Nalini stays with her elderly parents. Her daughter Sharmila (13) was studying in a school for special children but she was forced to stop her sending to school because of recurrent seizures. While she was struggling to provide medical care to her daughter, an unexpected diagnosis of Motheesawan came as a big blow. "I have no other option but to gather all my strength and take care of my children. My husband left us because he couldn't handle the pressure - he complains about running to hospitals day and night and not having any time to even sleep. How can I do that? I'm willing to do anything to save my children. When my husband left us, I was determined to provide education to my children at any cost and raise them as independent and healthy children but now they are at home suffering in their own ways. I can't bear to see them in pain. 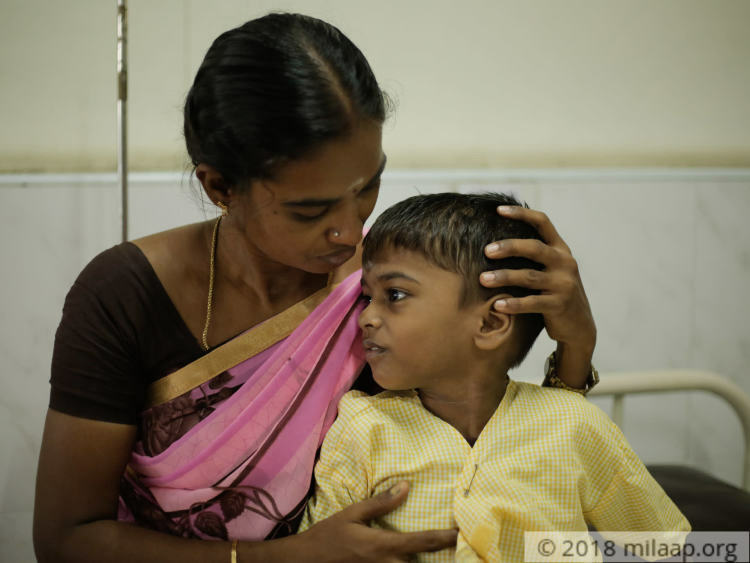 Now my focus is to save my son's life and it hurts when I can't afford to even buy medicines for him." - Nalini. Motheeswaran's condition is deteriorating every day. He needs immunoglobin IVIG to strengthen his immune system to fight infections and stay healthy. Liquid immunoglobin is taken from the blood plasma of the donors and given through the vein in the arms. He also needs antibiotics multiple times in a day. Any delay in treatment can lead to damage of internal organs and can slowly kill him. "My parents are also struggling to meet their ends, I feel terrible. We live with my father's pension money. I don't know what I can do to support my family. I do not travel by bus, I walk to the hospital to save money but that's not enough. His treatment costs in lakhs, whereas I can't afford even few thousands now. My children are my world. I thought my son would take care of his mentally challenged sister when he grows up, now he is battling for his life. I have no reason to live without them." - Nalini. 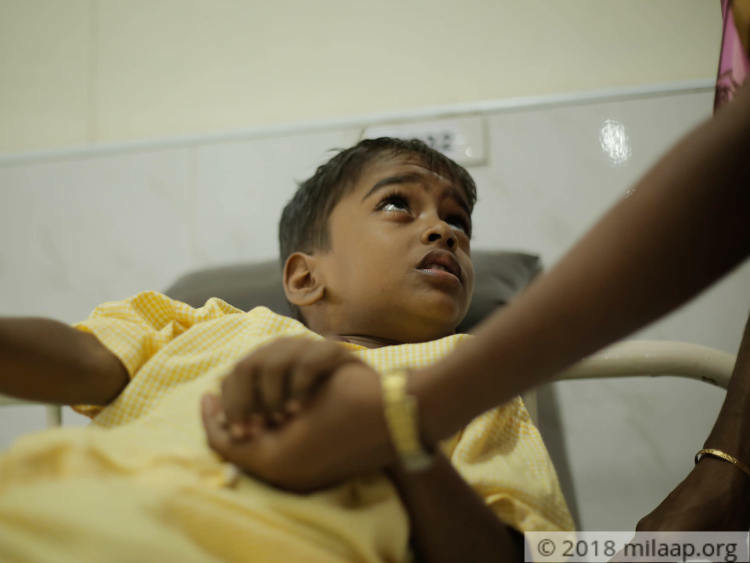 7-year-old Motheeswaran suffers from a rare immunodeficiency disorder and he needs urgent treatment to fight all the deadly infections. His mother Nalini, with no source of income, is struggling all alone to save him. Motheeswaran is the only hope of her life and losing him because of lack of funds would be terrible. Any delay in treatment can repair his internal organs beyond help. Treatment costs Rs 4 lakhs which is beyond her means. Only your support can save his life. 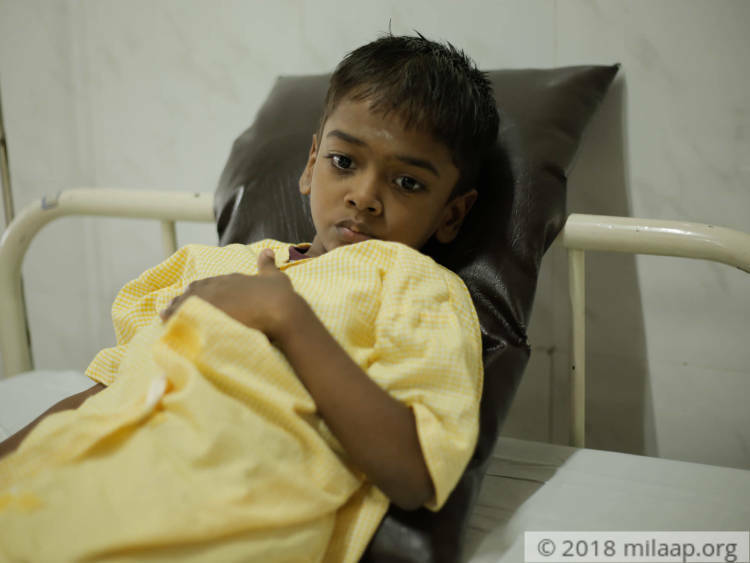 Your kind contribution can help this 7-year-old to live a normal life. Thank you for your love and support. This means a lot t us. Motheeswaran is currently doing okay and is undergoing treatment. He is currently at home and recovering. We are all hopeful about his recovery. 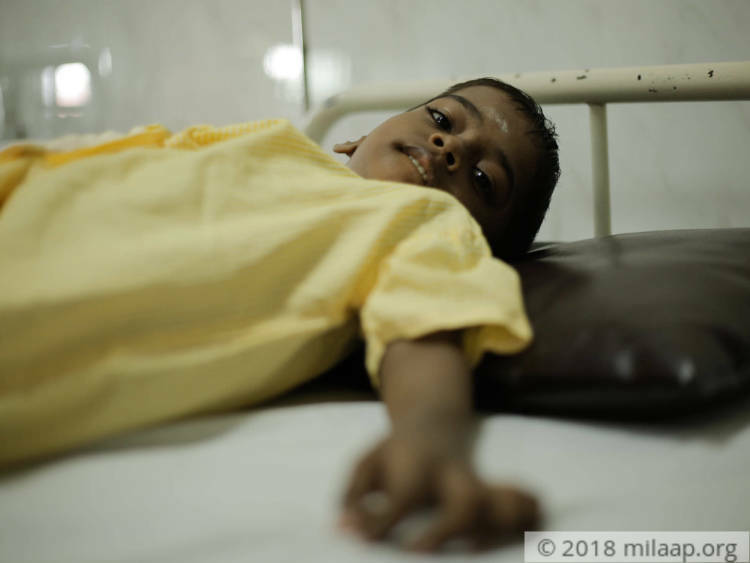 The doctors shall take a call on the further course of action depending on the response to the treatment being given now for immunodeficiency.